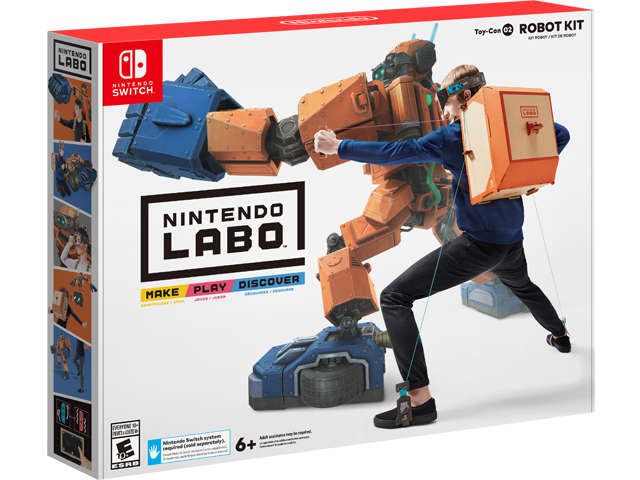 Make, Play, and Discover with Nintendo Labo™! Simply have fun making DIY cardboard creations called Toy-Con, bring them to life with the technology of the Nintendo Switch™ system (required; sold separately) to play games, and discover the magic behind how Toy-Con works. Express your creativity by customizing Toy-Con projects with your own color, stickers, paint, and more. You can even invent your own Toy-Con! Use pre-cut carboard kits to build your own robot suit, with easy-to-follow interactive instructions included in the Nintendo Labo software. After the making is complete, the kits come to life. Insert a Nintendo Switch Joy-Con™ controller into your Toy-Con to smashing buildings as a robot. Nintendo Labo lets you explore your curiosity to discover the mechanics of how each Toy-Con works and interacts with the Nintendo Switch technology. Find creative ways to customize your Toy-Con creations and invent new ways to play with Nintendo Labo!